Of course, the Carbon Edition Strike is newsworthy in its own right, but in our attempts to get more information – any information – out of Lightning, company reps were tight-lipped. 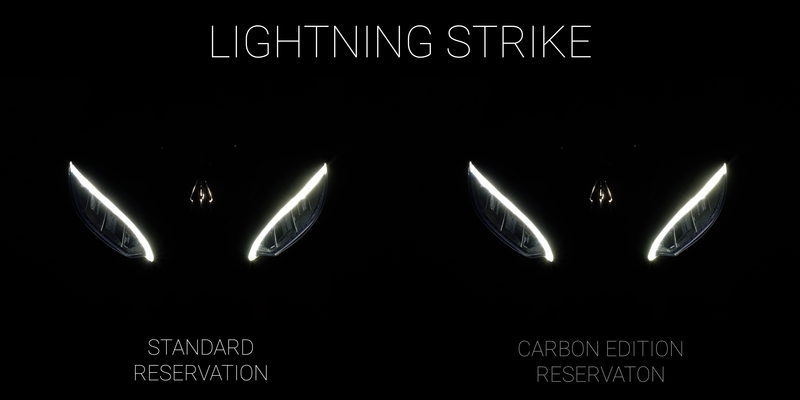 What we do know, apart from the teaser info from Lightning in the original announcement link, is the high-spec (we assume) Carbon Edition will be the first of the two versions rolling off the production line, and it will come with every option in the Lightning playbook. Lastly, we know entry to this party will cost you a fully refundable reservation of $10,000. From here, anything else the Carbon Edition may or may not have is strictly guesswork on our part. However, as the name would imply, expect the Carbon Edition to have plenty of the material everywhere. We’d expect the bodywork to be composed of carbon at the very least. Maybe wheels, too, but it’s highly unlikely any major chassis components will be carbon. Meanwhile, the standard Strike will begin its production after the Carbon Edition. Starting price will be $12,998 and the customer can configure the bike with various options after. Interestingly, the refundable reservation amount for the standard model is only $500. No, that’s not a typo. That’s all we know about the new Lightning Strike for now. Full product details will be given at the official launch and unveiling of the Strike, taking place March 2019.